Senate Majority Leader Mitch McConnell, with a rare smile and spring in his step, made clear Wednesday that he is happy with the outcome of the election that has increased his majority by at least three senators, calling President Donald Trump’s efforts “very helpful” with that victory. “Indeed it is a good morning for Senate Republicans,” the Kentucky Republicans told reporters. But gone was any hint of partisan crowing. In fact, McConnell called for “bipartisanship” numerous times and even offered some advice for his Democratic counterparts who retook the House majority and have promised multiple oversight investigations of the president, including a quest for his tax returns. “The Democrats in the House will have to decide just how much presidential harassment they think is good strategy. I’m not so sure it will work for them,” McConnell added, refusing to directly answer a question about a post-election presidential tweet implying Senate Republicans might just counter-investigate House Democrats for “leaks of Classified Information” in retaliation. 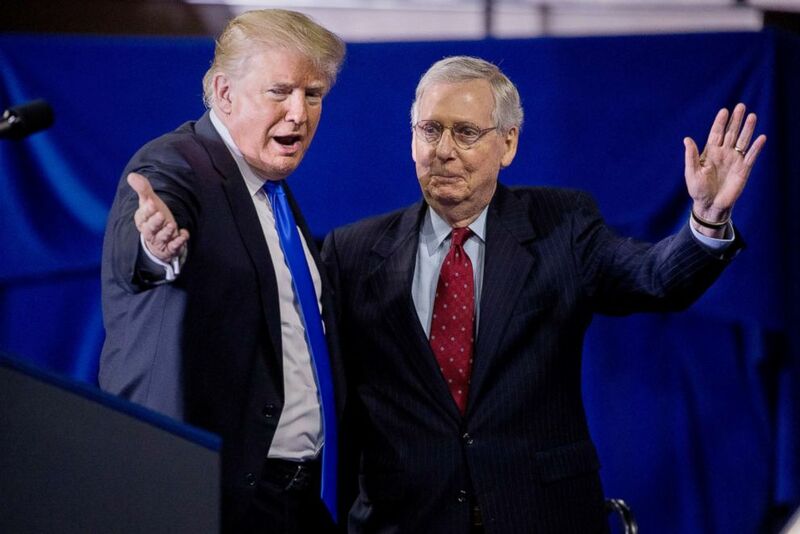 McConnell eschewed further attempts to get him to respond to heated presidential rhetoric, refusing to call the migrant caravan – still hundreds of miles from the southern U.S. border – a “crisis,” as Trump did in high profile campaign rallies designed to turn out the GOP base. And in a rare moment of practicality, the Republican leader, who is up for re-election in 2020, conceded that one of the GOP’s signature efforts — the repeal of “Obamacare” — is all but dead. “The rhetoric doesn’t solve the problem,” said McConnell. But old disagreements are not easily fixed, and partisan lines are deeper in a divided country that delivered a divided Congress. When asked where he could specifically find common ground with House Democratic Leader Nancy Pelosi, McConnell struggled to name examples – offering only the usual example of infrastructure, something that is often cited but rarely a bipartisan achievement. President Trump also cited this as an area where he could work with Democrats in 2016, but nothing has happened to date. The former is caught up in what could be a fierce fight over efforts to fund the government after December 7. President Trump wants as much as $5 billion to fund the southern border wall, but senior House Democratic advisers have told ABC News that Democrats, with a newly-reclaimed majority – will be loathe to provide one cent for that kind of funding.